Shame that the New Zealand government has been missing in action over the weekend, during the time when the Trump presidency has been carrying out its noxiously xenophobic, anti-Muslim, anti-refugee and anti-women agenda. The contrast between our silence and the forthright response by Canada has been obvious. Canada had reason to tread lightly – after all, the NAFTA trade deal is also in Trump’s gunsights. Yet Canada has firmly denounced the new US policy and offered to take in any refugees barred from the US. In addition, Canada has expressed keen interest in donating to the international fund being set up by the Netherlands to counter any shortfall caused by the Trump administration gag order on aid for abortion counseling. The difference being…. Canada has a leader. We have a bean counter who seems fixated on the political calculations involved here. One can imagine the weekend vacillations: no need to front this ; wait and see what the UK/Australia/everyone else does first; delay a response until we’re safely invisible, way back in the pack. Above all, try not to get conspicuously offside with the Trump administration. To that end, be sure to welcome any sign that the White House is (belatedly) showing restraint. Our government has a responsibility to defend our borders, but we must do so in a way that makes us safer and upholds all that is decent and exceptional about our nation…. 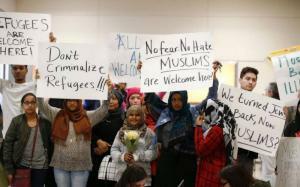 It is clear from the confusion at our airports across the nation that President Trump’s executive order was not properly vetted. Such a hasty process risks harmful results. We should not stop green-card holders from returning to the country they call home. We should not stop those who have served as interpreters for our military and diplomats from seeking refuge in the country they risked their lives to help. And we should not turn our backs on those refugees who have been shown through extensive vetting to pose no demonstrable threat to our nation, and who have suffered unspeakable horrors, most of them women and children. Ultimately, we fear this executive order will become a self-inflicted wound in the fight against terrorism….Our most important allies in the fight against ISIL are the vast majority of Muslims who reject its apocalyptic ideology of hatred. This executive order sends a signal, intended or not, that America does not want Muslims coming into our country. That is why we fear this executive order may do more to help terrorist recruitment than improve our security. All good points. Currently, there are New Zealand troops engaged in Iraq, as part of the US-led coalition that’s training the Iraqi Army and helping the Iraqi government to defeat the forces of Islamic State. Thanks to Trump’s policy, the citizens of the same country that we are fighting to defend are now being discriminated against and forbidden US entry; as are most of the refugees fleeing from conflicts that owe their origins to the US invasion of Iraq, in 2003. So… does Bill English think this current US policy of discrimination helps, or harms the goals that our troops are risking their lives in Iraq to achieve? Similarly, are we willing to join Canada and donate to the international fund being touted by the Netherlands to make up the shortfall in resources in abortion counselling, thanks to the re-instatement by Trump of the Reagan-era ‘gag order”? Paula Bennett, our new Minister for Women, has so far been noticeably silent on this issue, too. In reality, this is pure political posturing. Factors such as the religious persecution of minorities can already be considered by the refugee vetting authorities. So, this is mainly a pitch by Trump to his evangelical Christian supporters in the US. The 19 terrorists in the Sept. 11 attacks were from Saudi Arabia, Egypt, Lebanon and the United Arab Emirates….They are among the Muslim-majority countries not affected by Trump’s immigration freeze, but where Trump does business. Meanwhile, New Zealand keeps its silence. When Rip Van English finally does wake up and comment, you can bet he’ll welcome how the White House has already back-pedalled and will now exempt US green card holders from the travel ban. Praising Trump in the hope that this will ameliorate his behaviour is a losing strategy. To the rest of the world, it would look suspiciously like collusion with his actions. We need to denounce Trump and his agenda, because they’re so radically against this country’s best interests and values. Woody Guthrie’s “Deportees” is one of the most compassionate songs ever written about refugees – and about their potential human (and economic) value to the countries that host them. Guthrie wrote this song in outrage after hearing a radio news broadcast about an air crash in California that had dismissively described the victims as being “just deportees”. The best version of the song is by Guthrie’s fellow Oklahoman, the great James Talley. And at a time when Trump is making the United States unrecognisable, Talley’s beautiful version of the old chestnut “This Land Is Your Land” goes some way to rescuing patriotism from its current sorry state.